Heat oven to 375°F. Spray 10-inch skillet with cooking spray; heat over medium-high heat. Add beef and onion; cook until beef is thoroughly cooked, stirring frequently. Drain. Set aside 12 peas for garnish. Add remaining frozen vegetables, tomatoes and gravy; mix well. Heat to boiling. Reduce heat to medium-low; cover and cook 8 to 10 minutes or until vegetables are crisp-tender, stirring occasionally. Meanwhile, in medium saucepan, heat water, margarine and garlic powder to boiling. Remove from heat; add milk. Stir in potato flakes and cheese. Add egg; blend well. Into ungreased 8-inch square (2-quart) or oval (2 1/2-quart) glass baking dish, spoon beef mixture. 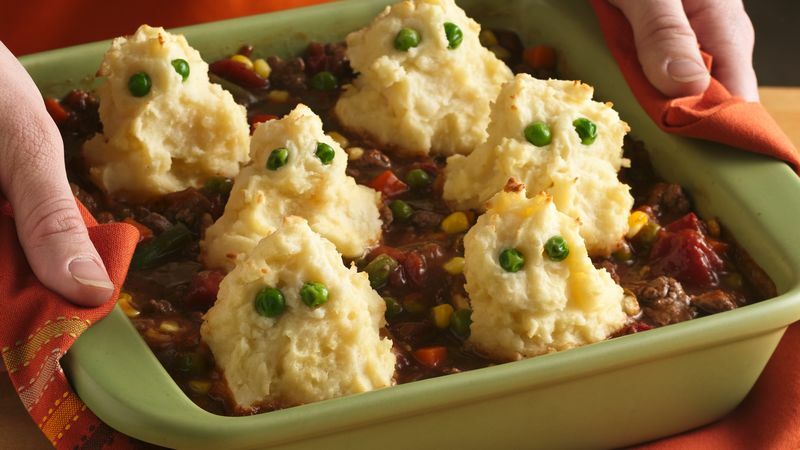 With large spoon, make 6 mounds of potato mixture on top of beef mixture to resemble ghosts. Place 2 reserved peas on each mound to resemble eyes. Bake at 375°F. for 20 to 25 minutes or until potatoes are set and mixture is thoroughly heated.